The 1500-m-thick marine strata of the Tethys Himalaya of the Zhepure Mountain (Tingri, Tibet) comprise the Upper Albian to Eocene and represent the sedimentary development of the passive northern continental margin of the Indian plate. Investigations of foraminifera have led to a detailed biozonation which is compared with the west Tethyan record. Five stratigraphic units can be distinguished: The Gamba group (Upper Albian - Lower Santonian) represents the development from a basin and slope to an outer-shelf environment. In the following Zhepure Shanbei formation (Lower Santonian - Middle Maastrichtian), outer-shelf deposits continue. Pebbles in the top layers point to beginning redeposition on a continental slope. Intensified redeposition continues within the Zhepure Shanpo formation (Middle Maastrichtian - Lower Paleocene). The series is capped by sandstones of the Jidula formation (Danian) deposited from a seaward prograding delta plain. The overall succession of these units represents a sea-level high at the Cenomanian/Turonian boundary followed, from the Turonian to Danian, by an overall shallowing-upward megasequence. This is followed by a final transgression — regression cycle during the Paleocene and Eocene, documented in the Zhepure Shan formation (?Upper Danian - Lutetian) and by Upper Eocene continental deposits. The section represents the narrowing and closure of the Tethys as a result of the convergence between northward-drifting India and Eurasia. 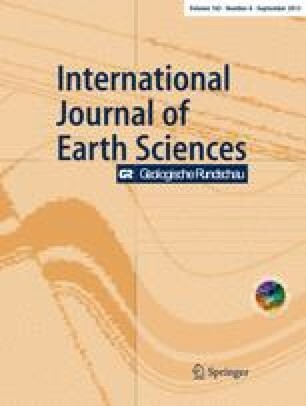 The plate collision started in the Lower Maastrichtian and caused rapid changes in sedimentation patterns affected by tectonic subsidence and uplift. Stronger subsidence and deposition took place from the Middle Maastrichtian to the Lower Paleocene. The final closure of remnant Tethys in the Tingri area took place in the Lutetian.